Joe L. lives in the UK. 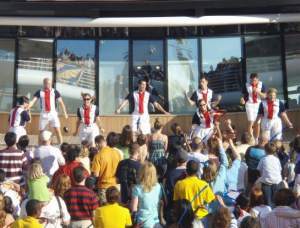 For two years he worked as a Entertainment Host for Disney Cruise Line (DCL), spending time on both the Wonder and Magic. Prior to DCL he obtained a BA in Media Production and worked in children’s / youth TV and sports coaching. Joe was also a local youth group leader and did some presenting and hosting work with Border TV and other corporate projects. This is Part I of II. What made you want to work on a cruise ship? I wanted a change, something where I could see the world and I liked the idea of living with others from around the world and meeting people from all walks of life. I also thought it might be the best place to be able to entertain, practice and hone some hosting and comedy talents that could lead to other things.